When flexibility is mentioned, most thoughts turn towards cheerleaders doing splits or gymnasts turning flips. Rarely will you see a 200+ pound bodybuilder finish a grueling set of deadlifts, and end a workout with toe touches. This is understandable since being able to touch your toes isn’t typically what gets a woman’s attention on the beach, or helps a competitor stand out on show day. When you go to the theater to watch a new movie, you rarely see the director appear in the film. However, we all know that his or her role in the movie was crucial, and that the movie is much better having had the director’s influence. Much like the director’s role in a film, flexibility, while often unnoticed by others can be very helpful in the outcome of your physique. We will discuss some common forms of flexibility and mobility work, and how they may be implemented in your own routine. Throughout the article I use the words "flexibility" and "mobility" almost interchangeably. Although there is a difference; flexibility being the ability to bend without breaking and mobility being the ability to move freely and easily; I don't think one can be very proficient without the other. So along with several flexibility exercises, we will also cover some exercises to help your mobility which will go hand in hand with helping you move safer and more efficiently as an athlete. The most well-known type of flexibility work is static stretching. This is one we have all had experience with throughout physical education classes in school. Static stretching is when certain positions are held tightly for approximately 15-30 seconds, allowing for the targeted muscle to slowly lengthen and loosen up. A more flexible muscle can provide a fuller range of motion during lifts which can allow for more muscle fiber recruitment, leading to increased hypertrophy. Originally thought to be best performed immediately prior to a workout, more research has supported the idea that this can actually be counterproductive. By statically stretching too long before exercise, the muscle can essentially become “too loose” and temporally lose strength (Comana). For a bodybuilder trying to progressively lift heavier weights, this is obviously undesirable. Although not optimal before a workout, static stretching performed at other times throughout the week can result in some surprising effects. Studies have shown that static stretching improved strength and force production in individuals who regularly included it into their workout routine (Kokkonen et. al). That being said, static stretching is now commonly performed immediately after a workout. This is a great time since the workout is finished and any short term loss in strength won't effect your performance; not to mention the increased core temperature of exercise makes for a much better static stretching environment since it will enable to you reach further into your stretches and also prevent pulled muscles that can occur from stretching "cold." Before we move on to the next topic, I would like to mention that while it's commonly stated that stretching post workout can reduce delayed onset muscle soreness (DOMS), it seems that the large majority of research tends to show that little to no difference in DOMS is seen in post exercise stretchers (Hebert et. al). Instead, a technique called "active recovery" used in the days following a workout seems to be a better option for reducing DOMS. Even though static stretching may not help prevent soreness, the increased range of motion, strength and force production that can be gained through static stretching makes it a very beneficial thing to include in your routine. For a sport focused on lifting heavy weights, this can be a valuable tool in helping athletes reach their genetic potential. Since static stretching isn’t recommended before a workout, how in the world are you supposed to get loose for those heavy sets of squats? Aside from the common 5-10 minutes of low intensity cardio, including dynamic stretching can be a great way to prepare for a workout. A study performed by East Stroudsburg University of Pennsylvania showed an improvement in college volleyball player’s vertical jump after performing a warm up including dynamic stretching (Dalrymple, et al. 2010). Although most bodybuilders won’t need to jump to spike a volleyball anytime soon, the potential benefits to your explosive strength could benefit movements requiring a lot of power such as heavy squats. This type of stretching relies on exercise specific movements performed in swift, fluid motions. These movements allow you to warm up muscles and joints while still keeping your muscle fibers elastic enough to produce optimal contractions. A few examples of this would be leg swings or arm circles. 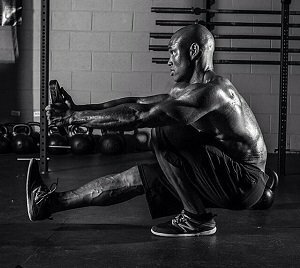 Movements such as bodyweight squats and lunges can be great options to add to your warm up as well. *Perform 10-15 reps of each exercises; repeating the sequences 1-2 more times. I’ve found that this really helps me to get a lot of blood flow in my muscle and joints, not to mention it does wonders for getting my mind right for the workout ahead and getting used to moving weight and executing forceful contractions with each repetition through a full range of motion. After increasing in popularity over the past few years, self myofascial release, more commonly known as foam rolling, has become a common mobility method for athletes. 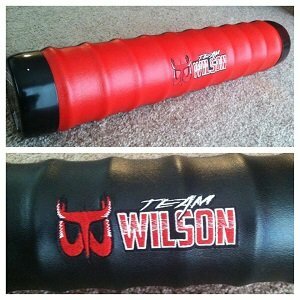 Foam rolling involves using a roller to target tight, disrupted fascia. Fascia is a type of connective tissue found throughout the entire body. Factors such as a sedentary lifestyle or intense force applied to the body can cause fascia to become tight and hardened in areas. "Intense force" is exactly what is generated from the weight training serious athletes take part in almost daily, year round. Like kinks in a water hose, tight fascia is thought to prevent the force absorbed during a movement from being spread more evenly throughout the body. This can lead to more total force concentrated on a smaller area of the body - causing discomfort, reduced range of motion, and potential injury. A deep tissues massage can feel great to a hard working athlete, but given the usual cost for a quality massage this can be a rare luxury to most bodybuilders. This is where self myofascial release can come in. After purchasing a foam roller, an athlete can provide themselves with a sort of at-home massage which may improve range of motion and reduce the risk of injury. With some practice this can be useful for those days when nothing seems to help loosen those tight muscles. Spending a few minutes foam rolling can help to "get out the kinks" and help you to move through a fuller range of motion during your workouts. As far as research is concerned there seems to be conflicting information on the efficacy of foam rolling. The Strength Guys have brought several studies to the attention of myself and numerous others through their social media accounts that suggest the effects of foam rolling may not be as great as previously thought by athletes. This conflict in belief is due to the shear difficulty of deforming fascia through manual manipulation (Chaudhry et. al) along with studies that have shown the effects of foam rolling to be rather acute. I cite the studies above not to suggest foam rolling is useless but instead to highlight the importance of being willing to learn and try out new methods while still keeping an eye on the current research in order to make the best use of your time training and dieting. My suggestion is to be open minded to new ideas and methods, but make sure to structure the bulk of your program around the tried and true foundations of training and nutrition. By doing this you can be assured that results will come from continually improving on the basics, yet still allow yourself to learn more about emerging methodologies, and give time for more research to be conducted on subjects before devoting a larger portion of time to their use. If you would like to try foam rolling for yourself, rollers can be bought from several websites and sporting goods stores. As foam rolling continues to gain recognition, companies have begun producing several versions. Rollers can be purchased in various colors, shapes, sizes and styles to give customers a more personalized product. Some come in different colors to represent different densities, which allow athletes to work their way up to more intensive rolling sessions. A very reputable and quality roller on the market is the Recoveroller by Barbell1. This company allows you to customize your roller by color as well as add your own logo and/or words to rep your favorite company or team! They also don't deform over time, preventing you from having to replace yours often like with some of the cheaper types. One word can explain the importance of proper flexibility – longevity. Bodybuilding is a demanding sport. Every workout we are pushing ourselves to the limit in order to spur new growth and improve. Those workouts also include an increasing risk of injury, especially as we age. Making sure we address flexibility in our workouts can be a great way to help ensure we are in the sport for a long time. A torn muscle can potentially put a bodybuilder on the sidelines for months. Rather than spend hours in physical therapy and thousands of dollars on medical bills we can instead spend a few minutes a day investing in one of the cheapest insurance policies around for an athlete, good flexibility. Examples of how to begin implementing flexibility work into your week are listed below. My advice would be to try various methods out and see what works best for your specific needs, then you can shift focus to what is most beneficial to you throughout the week. Incorporating flexibility work is a proven and cost effective way to ensure you are getting the most out of each workout. Most of us in this sport aren’t blessed with outstanding genetics. Many of us are constantly looking for ways to gain an edge on the competition. Whether it is a new supplement, workout, or sharing information between one another, we all want to find new ways to improve. With the benefits of adding flexibility into a bodybuilding routine, perhaps that deadlifting bodybuilder will rethink skipping the post workout stretching! Chaudhry, Hans, Robert Schleip, Zhiming Ji, Bruce Bukiet, Miriam Maney, and Thomas Findley. "Three-Dimensional Mathematical Model for Deformation of Human Fasciae in Manual Therap." The Journal of American Osteopathic Association 108.8 (2008): 379-90. Web. Comana, F. (n.d.). Functional programming for stability-mobility and movement. In C. Bryant & D. Green(Eds. ), ACE Personal Trainer Manual (4th ed., p. 253,373). San Diego, California: American Council on Exercise. Dalrymple, K., Davis, S., Dwyer, S., & Moir, G. (2010). Effect of static and dynamic stretching on vertical jump performance in collegiate women volleyball players. In W. Kraemer (Ed. ), The Journal of Strength and Conditioning Research (Vol. 24, pp. 149-154). Colorado Springs, CO: Lippincott Williams & Wilkins. Kokkonen, J., Nelson, A., Eldredge, C., & Winchester, J. (n.d.). Chronic static stretching improves exercise performance. (2007). Official Journal of the American College of Sports Medicine, 1825-1831.